Research shows nearly 12 million people in the United States suffer from food allergies. That’s nearly 25 percent of the total population, including one of every three Americans age 17 or younger. If you believe you may be affected, Allergy & Asthma Specialists of North Florida’s highly trained allergists can perform a food allergy test. What is Food Allergy Testing? Testing for food allergies involves a skin prick test or blood test for food allergies to detect IgE antibodies, which the body’s immune system creates to protect against food proteins it believes are harmful. When an antibody recognizes a certain food allergen, it triggers the body’s release of several combative chemicals including histamine into the bloodstream. This release is what brings on food allergy symptoms. These account for 90 percent of all food allergy reactions in the U.S. However, it is possible to be allergic to any food. 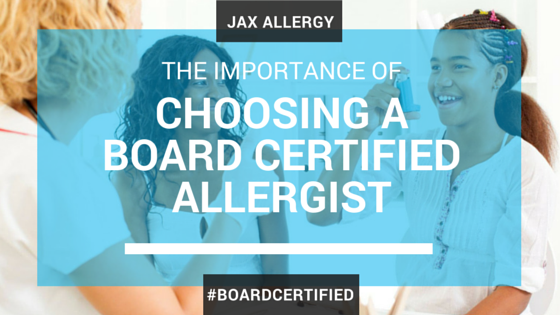 Once a food allergy is confirmed, your doctor will advise you to strictly avoid that particular food or ingredient. You’ll need to check food labels, talk with restaurant wait staff or chefs or call food manufacturers if you’re unsure whether a particular meal or product contains the allergen. Many children outgrow common food allergies, but there is no cure. You will also be prescribed injectable epinephrine to be utilized in the case of a severe allergic reaction to incidental ingestion of the food. If you suspect a food allergy in your family, call Allergy & Asthma Specialists of North Florida today. Our allergy specialist clinics are conveniently located near you — we can schedule an appointment at one of our four Jacksonville, FL area locations in Mandarin, on the Westside, on University Boulevard or in Orange Park in nearby Clay County.